PPC and Paid Social marketing software provider, Wordstream, has released an updated report on average PPC conversion rates as of 2018. Wordstream breaks down a variety of standard PPC metrics by industry including: CTR (click-through rate), Average Cost per Click (CPC), Conversion Rate, and Cost Per Action or Acquisition (CPA). If you’re not familiar with Wordstream, this company provides software and tools to help agencies and companies more effectively and efficiently manage their search engine marketing and paid social campaigns like Facebook Ads. Having been around for over 10 years now, Wordstream is one of the leaders in the search marketing space and has thousands and thousands of data points they can analyze from the PPC accounts that run through their software. As such, take this, and any report like this, with a grain of salt. We are looking at average PPC conversion rates from just one company’s data and not all PPC accounts currently running right now. We would anticipate that individuals using the software are likely on the average to more advanced-end of the PPC marketing spectrum, so these conversion rates may even be a bit higher than all accounts taken in aggregate around the world. Note: Leading landing page company Unbounce also released their own PPC Conversion Rates by Industry report specifically for “Lead Gen” campaigns. That report is here. 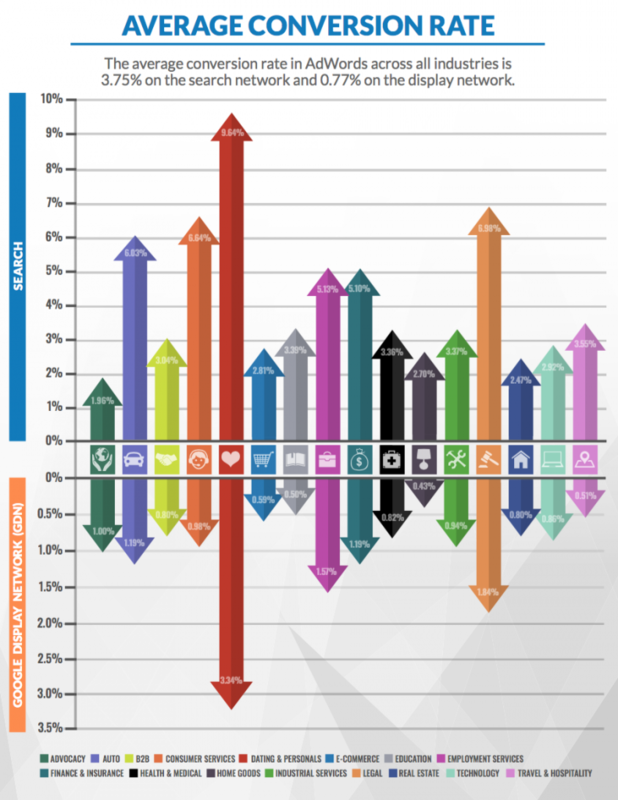 And digital marketing platform Acquisio released an Adwords PPC benchmark report here. 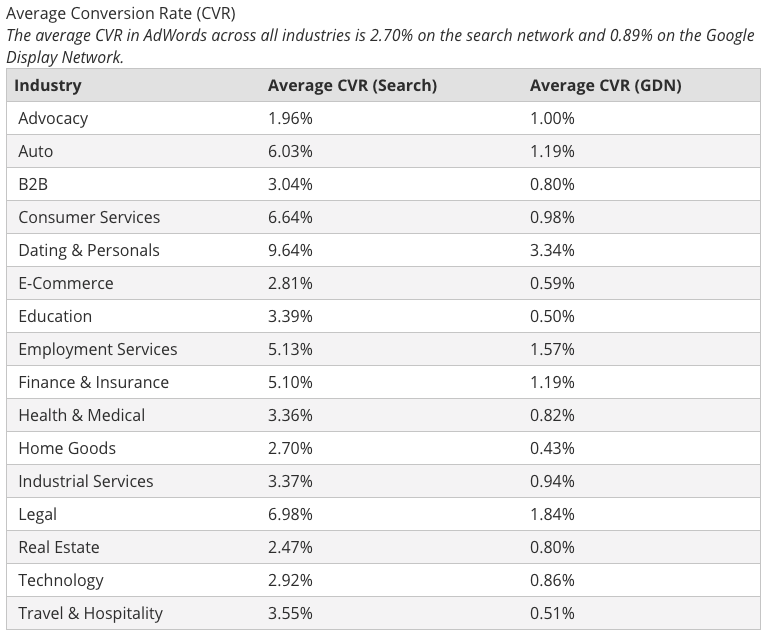 In addition to breaking out average PPC conversion rates by industry, the report also outlines conversion rates by network on the Adwords platform. 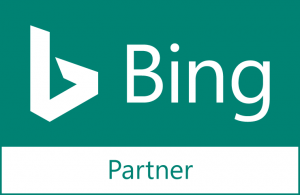 Most are familiar with the search network which includes Google search conversion rates and affiliated search engines (otherwise known as “search partners”). The report also breaks down conversion rates for the Google Display network, (GDN) which includes Google’s vast network of websites, apps, videos and other placements where your ads can be shown via image or text format. The average CVR (PPC Conversion Rate) in AdWords across all industries is 2.70% on the search network and 0.89% on the Google Display Network. (source). The industry with the highest average PPC conversion rates was the dating & personals industry with 9.64% on the search network and 3.34% on the display network. The industry with the lowest average PPC conversion rates was the “advocacy” industry at just 1.96% on the search network. Those selling products online and classified as an eCommerce business saw conversion rates of 2.81% (so just under 3%) on the search network. That means about 97% of visitors to eCommerce sites are NOT purchasing something. Remarketing campaigns, anyone? The legal space saw average PPC rates of around 7% on the search network. Are your PPC campaigns converting at these rates? Every industry and client is different, so again take these with a grain of salt. It’s interesting to see what the “industry” is seeing in terms of average PPC conversion rates, but what’s good for one business isn’t always good for another or even relevant for that business. If your PPC campaigns are suffering from low conversion rates, read our article on “Why Don’t My PPC Ads Convert?” for some initial areas where you may be able to improve.